Gw2 uses a server sided algorithm/software to automatically detect bot behavior, by analyzing data and statistics. In addition to that, there are also player reports. In all cases, a GM checks out your character before any action is taken. GW2 sends a unique “fingerprint” to the servers, identifying that you are you. Using any kind of VPN, Proxy or similiar tools have no effect, they just draw more attention to your character. You require a fresh windows and gw2 installation, in order to get a new “fingerprint”. Copying over any kind of VM image does not work. Do not bot several hours in the same area or map or in general. Randomize your behavior with the included BotMode: CustomTask, stretch your botting over several maps and zones. Do not Speedhack, Jump endlessly or teleport around. Do not let the bot run over night without supervising it now and them. If you do so, make sure you have ran that area before and confirm that there are no “stucks”. Do not do anything that is “repetitive” for several hours or over several days. This especially means do not gather for hours! Take breaks, like a normal human would. Do not send too much gold or regular gold amounts from player to player. 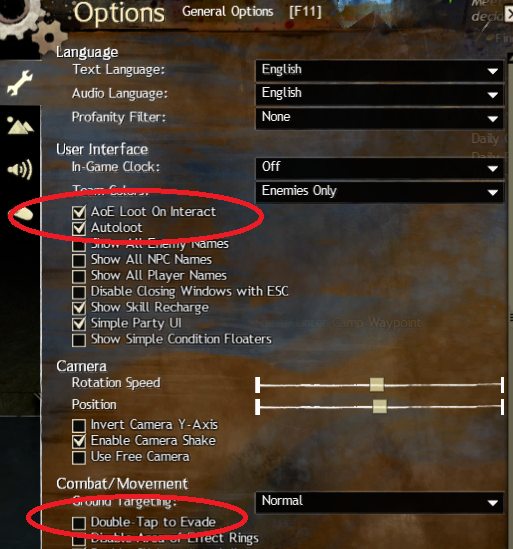 Enable “Autoloot” in your Guild wars 2 Game options. 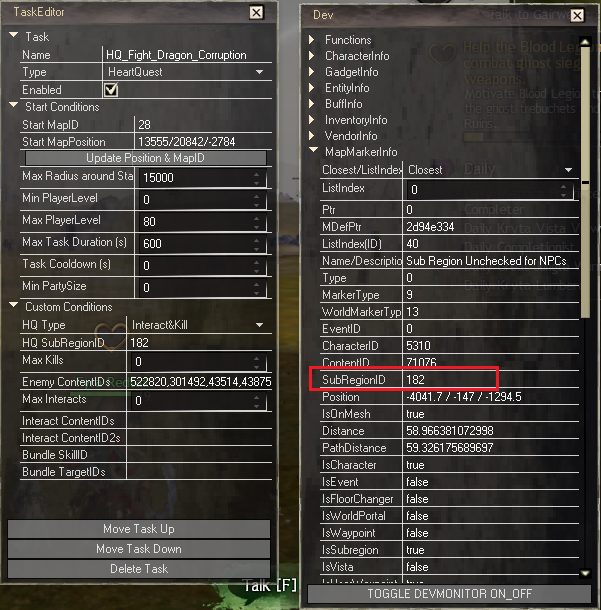 Disable “Double-Tab to Evade” in your Guild wars 2 Game options. The bot has by default settings which work good for everyone. You don't have to setup anything for your first run. 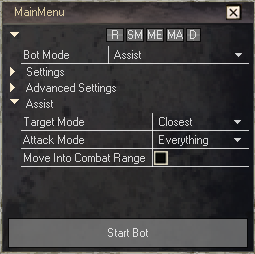 Just select the wanted BotMode and hit Start Bot. Deposit Items : Automatically Deposit Items to your Bank/Collectibles. Combat Movement : Toggle Combat Movement of the bot. Ignore yellow mobs : Toggle attacking of yellow enemies. Revive Players : Toggle Reviving Players while the bot runs. 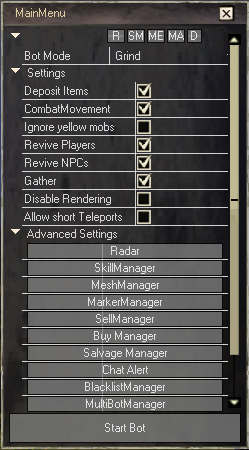 Revive NPCs : Toggle Reviving NPCs while the bot runs. Gather : Enable/Disable Gathering Resources while running. Disable Rendering : Toggle Rendering, reduces CPU/GPU load. BlacklistManager : Manage blacklisted enemies, items, etc. This Mode focuses the Bot on Killing Enemies and Doing Events. This Mode focuses the Bot on Gathering Resources. This Mode lets you steer your character while the Bot automatically attacks targets and evades. Move into Combat Range : Will move the character into attackrange. This works only with a Navmesh below your feet. 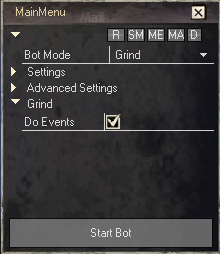 This Mode lets you setup a custom behavior of the Bot. Several Tasks can be queued behind each other in a Profile. This Mode is also used for MapCompletion. By default the bot comes with some Profiles which should get you close to 100% map completion. Due to constant updates and changes in the game itself, it can happen that a profile is broken. Due to the variety of the things you can do in GW2, not every Heartquest can be done by the bot. Go to the HeartQuest giving NPC, Open the “Dev Monitor” (@Menubar → Luamods → Dev) and press the TOGGLE button once. Unfold the MapMarkerInfo group in the Dev Module (like you can see on the picture above) and move around that NPC until you see the “Subregion unchecked for NPC” - Name (or when the SUBREGION ID is not empty), Copy that Subregion ID over into your new Task, to the “HQ SubRegionID” field. This step is important, make sure you are 100% having the correct ID. Goto where the “center” of that HeartQuest Task is (where most enemies you need to kill are, for example) and press the “Update Position & MapID” button once. Select the Type under Custom Conditions, in this example I selected “Interact&Kill”. Now most of the time you have to kill specific Enemies or Interact with Gadgets/Items. Open your DevMonitor again, unfold the CharacterInfo group and you will see a “ContentID” / “ContentID2”. Grab that ID from the Enemies you need to kill for example, and add this to your Task, like in the Screenshot above. If there are multiple Enemies/Gadget-Content IDs, then add them behind each other, separated by a comma. If you have to pickup a weapon/Item and use that on a Target, Get the “Bundle SkillID” from the Devmonitor's SpellInformation group. Underwater Cube Meshing - The basic thing that you need to know is: - Meshing cubes + triangles need to be connected on the shore of the sea/lake. Meaning the triangles need to go a little bit into the water on the surface where cubes are “below” them. Just a smaller area is enough. If you meshed / edited / SHOWED cubes, the cube navigation is DISABLED in that moment due to internal things. once you are done meshing cubes, you need to (save the cubes lol) reload the navmesh with no cubes to be shown. Then the navigation with cubes is enabled again.